The typical pattern for implementing an automatic property in a C# class is shown below–you do not need to define either a private backing variable, or the bodies of the get and set accessors. You can see the backing variable that the compiler automatically generated–k__BackingField. 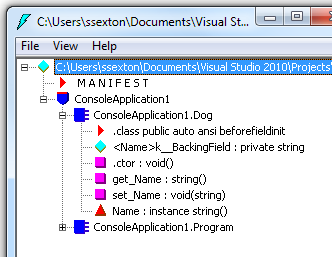 You can also see the get and set accessors that the compiler automatically created, get_Name and set_Name.